Borealis, a leading provider of innovative solutions in the fields of polyolefins, base chemicals and fertilizers, announces the successful launch of a new packaging solution produced entirely with post-consumer recycled (PCR) material. Developed in close collaboration with the German consumer and industrial goods company Henkel and two additional value chain partners, this truly sustainable packaging solution is further evidence of how mtm plastics GmbH, a member of the Borealis Group, is helping increase the circularity of plastics. In 2016, Borealis acquired leading German recycler mtm plastics GmbH, which is now a member of the Borealis Group. By leveraging their respective areas of expertise and decades of experience as a virgin polyolefins producer and “upcycler”, respectively, Borealis and mtm plastics are exploring new growth opportunities with joint forces. A success story originating from this exploration is a recently completed pilot project with Henkel, the global leader for adhesives, sealants and functional coatings. 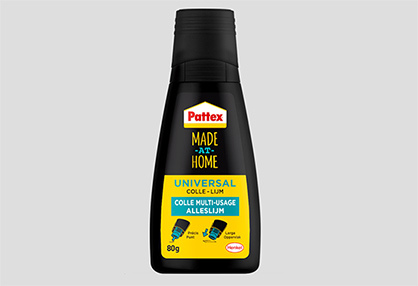 The companies have worked to develop a new packaging solution based on recycled material for the Made-at-Home all-purpose glue bottle and cap, which Henkel is marketing under its well-known Pattex brand. The aim was to replace the virgin plastic material traditionally used for this packaging with a recyclate-based resin. The resin, however, had to fulfil the diverse material demands for packaging of an adhesive product. After extensive and joint application development, a new bottle was developed with the proprietary mtm product Purpolen® PE, a high-quality polyethylene regranulate produced by mtm at its facilities in Niedergebra, Germany. Value chain partner KKT Kaller Kunststoff Technik GmbH, a plastics processor also based in Germany, manufactured the bottles. For the three separate components of the adjustable applicator nozzle, which is used for both filigree and wide-area gluing, high-quality Purpolen® PP polypropylene regranulate produced by mtm was identified as the ideal solution. German plastic components manufacturer bomo trendline Technik GmbH produced the applicator nozzles. The new Pattex Made-at-Home packaging solution successfully passed extensive application tests, including a three-month storage test and other tests of mechanical properties. It was launched on the European market in 2018. (c) 2018 henkel AG & Co.